With it's cross ribbed body and appendages to make large movements, the X Zone Lure's 6" Muscle Back Hawg Hunter is a creature bait that will feed the bass during the warmer season. With both salt and scent infused, the soft plastic creature bait will be sure to present a meal while you are punching mats or flipping docks. 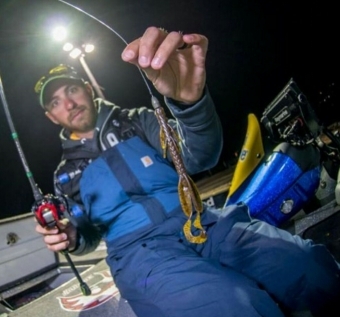 X Zone Lure's Elite Series Pro Brandon Lester secured a 6th place position on Grand Lake using the NEW X Zone Lure's Pro Series 6" Muscle Back Hawg Hunter and he shares his thoughts on why this creature bait will get the job done. These baits can be use flipping around logs, wood with a Texas rigged presentation. An offset wide gap hook ranging in size from 3/0 to 5/0 is used for piercing through the body of this creature bait. The standard tackle for this power-fishing tactic includes a 7-foot pitching or 7 1/2-foot flipping stick and baitcaster reel filled with 17- to 30-pound test fluorocarbon or 50- to 65-pound braid. 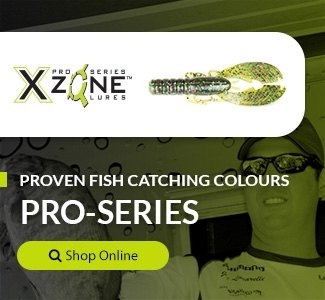 Punching through matted hydrilla and milfoil this X Zone Lures Muscle Back Hawg Hunter has a bit thinner presentation so that during the warm weather months, anytime the fish are feeding on big baits, the bass will be attracted to this bait. The versatility of a Muscle Back Hawg Hunter bait allows you to fish it in cover with a variety of presentations. If the cover is vertical such as a stump without a lot of roots, let the bait fall down alongside the stump and let it sit there, giving it just slight movements. When fishing horizontal cover such as laydowns or boat docks keep your bait moving frequently to attract the fish.